Stranded on an unchartered island you become a part of a mystery haunting one family for decades. Reveal new locations and piece together artifacts to prove the legend of the Incan Sun. Flip letters, make words, and solve familiar phrases in this sequel to the hit Flip Words! Compete for a dream job with Donald Trump. You'll need plenty of business savvy to become The Apprentice! While Adrianna is transporting priceless antiques, a thief steals them from right under her! Help her track down the stolen treasures throughout Europe, all while evading the evil thief. Dive deep beneath the waves to the lost city of Atlantis and join Hannah on her search for the true story of Neptune's demise, the secrets of her own lineage and the power of her amulet. Grandma's faulty time machine lands the Diner Dash dynamic duo in medieval times! There they encounter Merlin the magician who just happens to know why they're there and how they might escape. Of course, it all hinges on one little favor. Slap together tasty ingredients to satisfy the cravings of hungry patrons. Be quick to serve them before they leave in a huff! Get ready to manage a team of zany co-workers! Juggle incoming work tasks, keep everyone from getting stressed out, and help the co-workers achieve their goals. 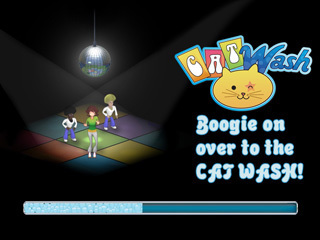 Shake your groove thing at the Cat Wash and go where all the cool cats come to get clean! Boogie down in this time management game through over 40 levels of disco and dance. Live it up, 'cause the party never stops at the <em>Cat Wash</em>! Take a trip back to Jill Evans' ™ hometown of Bakersfield in <em>Cake Mania Main Street</em> and raise money to revitalize the neighborhood! Play though 100 levels, purchase and upgrade 4 different shops and unlock 40 delicious recipes! Help Alicia expand her business beyond her dreams by assisting each customer in their search for the perfect outfit, adding just the right accessories, and choosing the best upgrades and enhancements for each location. After arriving on Big Island you discover that the "fortune" you've just inherited is... an orchard? Turn your fields into a real fortune by opening a smoothie stand! Build up your spooky Fishdom! Earn cash as you complete match 3 levels and spend it to fix up your spooktacular tank. Purchase almost 200 boo-tiful fish and accessories to design an unlimited number of tanks! If you thought life in the big city was crazy, wait until you get a load of the country life! Cultivate fields, feed farm animals and sell the items that they produce. Show Old MacDonald how it's done! Try an exciting crossword-style word game that measures your Mojo as you skillfully create chains of words over random colored squares to advance the ultimate Mega Mojo Round. Adventure and jeopardy await you in this amazing hidden object game! Join Marcus as he travels through 17 locations in Rome to win the heart of the Emperor's daughter. Cultivate a buzzing organic nursery with Kelly Green! Grow plants, arrange floral bouquets, or wow the local farmer with an array of 20 different plants. Put your green thumb to the test in 50 levels and 4 seasons of planting! Unleash your inner mayor in this strategy game! Produce goods and deliver them to shopping malls, launch public events to keep your citizens happy, and trade with neighboring cities to build the city of your dreams! Join Rachel as she builds the perfect getaway spa destination. Offer fun activities for beauty and relaxation in Rachel’s Retreat!